The bandido, the harlot, the male buffoon, the female clown, the Latin lover, and the dark lady—these have been the defining, and demeaning, images of Latinos in U.S. cinema for more than a century. In this book, Charles Ramírez Berg develops an innovative theory of stereotyping that accounts for the persistence of such images in U.S. popular culture. 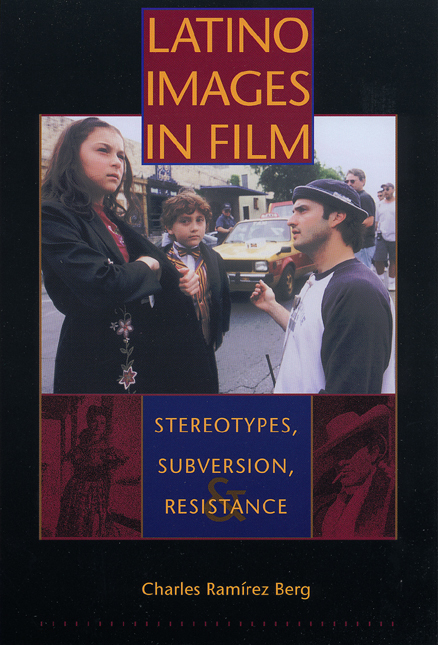 He also explores how Latino actors and filmmakers have actively subverted and resisted such stereotyping. In the first part of the book, Berg sets forth his theory of stereotyping, defines the classic stereotypes, and investigates how actors such as Raúl Julia, Rosie Pérez, José Ferrer, Lupe Vélez, and Gilbert Roland have subverted stereotypical roles. In the second part, he analyzes Hollywood's portrayal of Latinos in three genres: social problem films, John Ford westerns, and science fiction films. In the concluding section, Berg looks at Latino self-representation and anti-stereotyping in Mexican American border documentaries and in the feature films of Robert Rodríguez. He also presents an exclusive interview in which Rodríguez talks about his entire career, from Bedhead to Spy Kids, and comments on the role of a Latino filmmaker in Hollywood and how he tries to subvert the system. Conclusion: The End of Stereotypes? Charles Ramírez Berg is University Distinguished Teaching Professor and Associate Professor of Radio-Television-Film at the University of Texas at Austin. The University of Texas at Austin, where I teach, happens to be an orientation center for the Fulbright Scholars Program. Every summer, scores of foreign students from around the world and in various disciplines begin their graduate study in this country by coming to campuses like the University of Texas for an introduction to U.S. higher education and American culture. After several weeks here, they go on to their respective universities across the country to commence graduate work. On several occasions I have had the opportunity to give lectures to these students on the topic of this book, the representation of Latinos in Hollywood movies. During one of these talks, in August 1988, just as I was about to list the characteristics of the bandido stereotype, something stopped me. Instead of describing the Mexican bandit myself, I asked them if they could. Immediately several hands went up, and in a matter of seconds the group sketched a vivid verbal picture of el bandido. Try it yourself and see if you don't come up with the same image they did, composed of these familiar details: the dark, sweaty, unshaven face (scar and gold tooth optional); the bandoleras, the bullet belts crisscrossed across his chest (creating an "X-marks-the-bandit" visual sign); the wide-brimmed sombrero; his weapons of choice (dagger and pistola); the ubiquitous bottle of tequila; the antisocial attitude (whose limited range stretches from the lecherous leer to the scornful scowl); the violent, criminal, generally pathological behavior (he is a bundle of hostility waiting to erupt). Where had that image come from? In prompting their description, I had not cued them by mentioning a specific film, actor, or scene; nor had I shown a photograph or film clip (I did that afterward). And yet they rapidly accessed the stereotype from some mental image database and precisely rendered it. My guess was that one prominent source for the image they so accurately recalled was the media, primarily the globally dominant U.S. media, and specifically—though not exclusively—Hollywood movies (no doubt Italian and Spanish spaghetti Westerns, which reactivated the stock bandido image, also shaped some of their responses). This study investigates the cinematic sterotyping process that, I believe, in large part made it possible for those Fulbright students—and, I would venture to guess, most of us—to describe the Mexican bandido so immediately, effortlessly, and exactly. Latino Images in Film grows out of more than a decade of teaching, writing, and lecturing about stereotyping in movies in general and of the depiction of Latinos in Hollywood film in particular. I began researching this topic when I was asked to teach a course called "Chicanos and Film" for the University of Texas Center for Mexican American Studies in 1987. Though the course was on the books, it had not been taught for some time; I had no former teacher to advise me, and course materials and syllabi were nonexistent. Forced to start from scratch, I soon realized that I was dealing with two main topics: stereotyping and a smaller subset of that subject, Hollywood's representation of Latinos. On stereotyping, I was faced with a confounding wealth of literature, mainly in the social sciences, psychology, and sociology. I wanted to begin my study with a basic understanding of terms, so I needed a handy explanation of stereotypes and the process of stereotyping. But what I discovered was that these concepts meant different things to different researchers in different fields. Initially bewildered, I nevertheless kept working to see if I could synthesize a theory of stereotyping that I could then apply to films. The result of that theory-building forms the first section of this book. Concerning Latino movie imagery, on the other hand, there was a scarcity of information. Allen L. Woll's short but useful history, The Latin Image in American Film, provided a worthwhile introduction. There was also Arthur Pettit's insightful look at Latin images in literature and film, and a collection of essays, Chicano Cinema, edited by Gary D. Keller. Clint Wilson and Felix Gutiérrez's practical study, Minorities and Media, focused on the portrayal of four main groups in the mass media: Asians, Native Americans, African Americans, and Latinos. Beyond that, there were a few articles, and several stirring Chicano filmmaking manifestos, which used Hollywood's stereotyping of Latinos and the studios' closed-door policy toward young Chicano writers, directors, and producers as the basis for their emerging film aesthetic. And that was it. Clearly there was a lot of critical and historical work yet to be done on Latino stereotypes in the movies. Happily, that work has begun. Since 1987 there has been an impressive boom in the study of representation in the media in general and of Latinos in particular, a boom that I am happy and proud to have participated in and contributed to. As far as the scholarly analysis of Latino imagery in film goes, the landmark work was Chon Noriega's editing of the first anthology of Chicano film criticism, Chicanos and Film: Representation and Resistance in 1992. This was followed by another key anthology, this time with a broader, pan-Latino focus, The Ethnic Eye: Latino Media Arts, edited by Noriega and Ana López in 1996. Several other important anthologies and books soon followed. In addition, there is a lengthy and growing list of important articles by, among others, Carlos Cortés, Rosa Linda Fregoso, Lilian Jiménez, Christine List, Ana López, David R. Maciel, Kathleen Newman, Chon Noriega, and Federico A. Subervi-Vélez. However, none of these books or articles, unquestionably significant and impressive as they are, addresses Latinos in film from quite the same vantage point as I do in this book. Latino Images in Film is meant to serve as an introduction to the operation of stereotyping, to analyze how it functions in film, and then to apply that knowledge to the critical analysis of the depiction of Latinos in U.S. cinema. Or, rather, why study stereotypes anymore, now that "images of" analysis has long since been actively pursued but then declared passé in film criticism and theory? Because my own research indicates that there are still important benefits to be gained from it. One of the most significant is the fact that studying stereotypes takes one back to the social sciences, and that provides a way to connect film criticism with lived experience. Social scientific research is empirical; it bases its conclusions on the experiences of individuals and social groups. On the other hand, film theory is of necessity ontological and conceptual; it seeks to grasp the essential nature of the film medium. Film criticism is interpretive: informed conjecture on the significance of a text. Neither is empirical in the scientific sense, which leads to a stumbling block in much of film theory and criticism, namely, how to connect philosophical and critical speculation with the lives that people actually live. Beginning with sociological and psychological studies on stereotyping, based as they are on ethnographic studies, surveys, lab experiments, and other empirical investigation methods, then, provides me a way to make one type of film-society link. Through the social science lens, stereotyping in film can be seen as a graphic manifestation of the psychosocial process of stereotyping in society in general. However, the movement away from "images of" analyses in film studies is, in my estimation, a correct one. The study of representation in the media must be more than simple content analysis, a game of "spotting the stereotype," cataloging it, then bemoaning Hollywood movies for their pernicious imagery. It has to branch out in at least two directions. First, film representation needs to be understood within a social and historical context. The images of Latinos in American film exist not in a vacuum but as part of a larger discourse on Otherness in the United States. Beyond their existence as mental constructs or film images, stereotypes are part of a social conversation that reveals the mainstream's attitudes about Others. The case of Latino stereotyping in mass media involves a discursive system that might be called "Latinism" (a play on Edward Said's Orientalism): the construction of Latin America and its inhabitants and of Latinos in this country to justify the United States' imperialistic goals. Operationalized externally as the Monroe Doctrine and internally as Manifest Destiny, U.S. imperialism was based on the notion that the nation should control the entire hemisphere and was willing to fight anyone who disagreed. For centuries, the precepts underpinning the Monroe Doctrine have been used as a rationale for U.S. interference in the internal politics of Latin America. On the whole, Hollywood endorsed North American dominance of this hemisphere, and as often as it depicted that hegemony uncritically, movies helped to perpetuate it. In the United States, especially in the Southwest, Manifest Destiny meant taking land from Mexico, displacing Mexican landowners, subjugating Tejanos, Hispanos, and Californios (Texans, New Mexicans, and Californians of Mexican heritage), and exploiting them as cheap and expendable labor. In order to rationalize the expansionist goals laid out by the Monroe Doctrine and Manifest Destiny, Latinos—whether U.S. citizens, newly arrived migrants from the south, or Latin Americans in their own countries—needed to be shown as lesser beings. Movie stereotyping of Latinos, therefore, has been and continues to be part of an American imperialistic discourse about who should rule the hemisphere—a sort of "Monroe Doctrine and Manifest Destiny Illustrated." The second way that the analysis of Latino representation in the movies must move beyond superficial content analysis is by looking at the deep structure of Hollywood cinema. That is, we need to investigate how standardized cinematic techniques, the accepted norms of "good" filmmaking (including the star system, casting, screenwriting, camera angles, shot selection, direction, production design, editing, acting conventions, lighting, framing, makeup, costuming, and mise-en-scène), all contribute to the totality of the image we call a stereotype. Furthermore, we need to explore the narrative function that stereotypes play within classical Hollywood films and their purpose in various popular genres. This general trajectory—from stereotyping in general to stereotyping in film to the significance of Latino imagery in three genres (social problem films, Westerns, and science fiction films)—forms the first two parts of this book. The third part looks at some ways that Latino filmmakers have tried to break with this pattern of representation through self-representation. And here is another example of how the proper, in-depth study of stereotypes can help us analyze those films: surely one good way for us as critics to judge the efficacy of Latino filmmakers' anti-stereotyping aesthetic is to know the detailed workings of Hollywood's stereotyping apparatus that so many of them were reacting against. I use the terms "Latino," "Latin American," "Chicano," and "Mexican American" quite a bit, and I should explain what I mean by them. "Latino" is the umbrella term for people of Latin American descent that in recent years has supplanted the more imprecise and bureaucratic designation "Hispanic." Thus Cuban Americans, Puerto Ricans, Mexican Americans, and any people who trace their ethnic roots back to Central or South America are considered Latino if they live in the United States. Those citizens of Central or South America I refer to as Latin Americans, or by their specific nationality. However, when speaking of the stereotypes developed by Hollywood, I have used the term "Latino stereotypes" to mean both U.S. Latinos and Latin Americans. I do this for the sake of convenience and to emphasize the fact that Hollywood did not differentiate between these two broad groups in its stereotyping imagery. As far as Hollywood was concerned, U.S. Latinos and Latin Americans could all be lumped together as people with identical characteristics; as such, they could all be uniformly depicted stereotypically as bandits, harlots, Latin lovers, and so forth. And if Hollywood made no distinction between Latinos and Latin Americans, it certainly could not be expected to make finer distinctions, between, say, Mexicans (citizens of Mexico) and Mexican Americans (citizens of the United States). "Chicano" is the term made popular by the Mexican American civil rights movement in the 1960s and 1970s; as an ethnic self-identifying label, it implied pride as well as activism and oppositional politics, much as the term "Black" did for African Americans during the same period. It is still used in this context, when referring to the movement or to ourselves as Mexican Americans, particularly by those of us who lived through that period. Our children, however, tend to prefer the term "Mexican American." In this book I have tried to use "Chicano" when I mean more politicized filmmaking and criticism, and "Mexican American" when referring to our more recent creative and critical practices. Thus Luis Valdez, who began his creative work by producing radical theater in support of the unionizing efforts of César Chavez, is referred to as a Chicano filmmaker. Robert Rodríguez, though he is also interested in correcting, countering, and avoiding stereotypes, belongs to a different generation of filmmakers. He was probably influenced more by Alfred Hitchcock, John Woo, and Steven Spielberg than by the Chicano movement or early Chicano filmmakers, and I refer to him as a Mexican American or Latino filmmaker. In Spanish, nouns are gender-identified through an "o" or "a" suffix, with a distinction between Chicano (male) and Chicana (female). When used alone, the male form, Chicano, denotes both male and female. The use of Chicano in such a context, however, tends to present the same problems as the word or suffix "man" does in English: it provides convenient cover for an essentially male discourse. Various alternatives have been proposed, the most popular being Chicano/a. Like many Chicana feminist critics, however, I use Chicano as a cultural and political self-designation vis-à-vis the dominant culture, but (I hope) avoid the implicit male emphasis usually given the term. Also, at times I make a clear distinction between Chicano and Chicana critical and cinematic practices. At times I will similarly make the same distinction. For example, when I refer to Lourdes Portillo's film The Devil Never Sleeps as "Chicana film noir" in Chapter 8, I specifically mean a feminist variation on familiar Hollywood film noir genre themes made by an activist Mexican American filmmaker. There is also the question of what to call members of the U.S. social dominant. "White" is the oft-used term, but as much as possible I shy away from using it because doing so, in my mind at least, reifies crude and essentialist racial categories—white, black, brown, yellow. As Richard Dyer has so convincingly shown, the idea of an essential white category (and by implication any racial classification) is a convenient—and divisive—social construct. I use the term "Anglo" instead—not because it is any less problematic denotatively, but it seems to me to be less charged connotatively. Finally, there is the problematic term "American cinema," which is commonly used when referring to U.S. films. But the United States is not America, only part of North America. A more accurate term might be "North American cinema," but, again, that excludes Canada and, depending on how one defines it, Greenland, Mexico, and the Carribean. The most accurate term to speak of the totality of this nation's filmmaking, both Hollywood and independent films, is "U.S. cinema," and I use that term sometimes, although it has the disadvantage of being both cumbersome and not in common usage. Despite my qualms about it, then, "American cinema" is the term generally accepted and widely understood, and if I use it here it is for convenience, and not in any way to disparage, discount, or dismiss the cinematic traditions of other North and South American countries. Latino Images in Film began as a slightly different project. At the urging of several editors, I originally intended simply to compile the articles I had written on Latino stereotypes in American film over the years, especially since some of them are difficult to find. Once I began, however, I realized that I needed to elaborate, refine, and develop some of my ideas, particularly regarding my theorizing of stereotyping in Hollywood film. I also realized that my taxonomy of six familiar Latino stereotypes did not tell the full story of Latino imagery in American cinema. There were some fascinating exceptions to the rule, Anglo filmmakers in the Hollywood system, like Richard Brooks in Crisis (1950), who managed to avoid stereotypes. In addition, there were certain wily Latino performers, like Lupe Vélez, Gilbert Roland, and José Ferrer, who found ways to subvert Hollywood's stereotyping machinery. The resulting book, then, is a mix of new and old. It is composed of four new theoretical chapters that form Part 1. Also new is the book's extensive interview of the most successful Latino director in Hollywood history, Robert Rodríguez, in Chapter 10. Having written an essay (which appears here as Chapter 9) about his first two films, his student-short Bedhead (1990) and El Mariachi (1992), I wanted to follow up and talk about the rest of his career. Specifically, I wanted to know how he thought he could balance his ethnic pride with mainstream moviemaking success. Finally, I conclude with a newly written look at the present state of Latino images in American cinema. It considers the current "Latin boom" in U.S. entertainment and contrasts it with an earlier one in the 1920s. Seeking to evaluate the significance of the recent rise of Latinos in the movies, it draws a comparison with the ascent of another denigrated ethnic group—the Irish—in classical Hollywood cinema. This new material appears along with five essays (Chapters 5-9) on Latino representation that I have written over the past decade. In the present context, these essays serve as case studies looking at Latino representation in various film genres. Three of the essays appear in Part 2, which looks at Latino images in three classical Hollywood genres—the social problem film, the Western, and the science fiction film. Two more essays, one on Chicano border documentaries and another on Robert Rodríguez's early career, appear in Part 3, the Latino counterimagery part of the book. How much did I alter these previously published works? On the whole, I opted for minor revisions that would bring them up-to-date with current critical literature, rather than larger-scale rewriting or reconceptualizing. The changes in Chapter 5, on Bordertown (1935) and the Chicano social problem films, for instance, will be found mainly in the footnotes. Chapter 6, on the representation of Latinos and other ethnics in the films of John Ford, has not been changed at all. I debated how much to alter Chapter 7, an essay based on the notion that aliens in science fiction films could be regarded as figures for real-life Latin American immigrants to the United States. In the end I pretty much left it alone. I know that since it was published, in the fall of 1989, there have been many more science fiction films released that could be added to the list. But any critical piece eventually falls behind the flow of film releases. And, in addition, I felt that the ideas in the essay are still sound. Moreover, it allows readers to apply those ideas to the newer films, as I do when I teach that essay in my classes. So I hope that readers will feel free to use the approach I delineate when they analyze more-recent science fiction films about aliens, such as The Arrival (1996), Independence Day (1996), and Men in Black (1997). In Part 3, the Latino counterimages part of the study, Chapter 8, on Chicano border documentaries, has been improved by the addition of footnotes directing the reader to other criticism of the films of Lourdes Portillo. In my mind, the updating of Chapter 9, on Robert Rodríguez's early career, is Chapter 10, the interview with Rodríguez. One clarification that I want to make about this counterimagery section concerns my focus. Though I center on Latino stereotypes in Hollywood film in the book's first seven chapters, in the last section I emphasize the Mexican American response. I do so for several reasons. One is that as a Mexican American I feel more qualified to analyze Mexican American films than I would if I were speaking of, say, the Puerto Rican cinematic response. A second reason is that I know Mexican American cinema better than other Latino cinemas (Puerto Rican or Cuban American, for example), having studied and taught it for nearly a decade and a half. A third reason is that Chicano film is a branch of Latino cinema that has a prolific and sustained thirty-year history. Moreover, it began specifically in opposition to the Hollywood paradigm, so my concentration on its history seems not only reasonable but called for. Finally, there is the interesting fact that so much of Chicano cinema originated in the cradle of mainstream studio cinema, Southern California. Viewed in that context, one might consider Chicano cinema of the past thirty years to have been mainstream American film's "shadow cinema," maybe even serving as Hollywood's "ethnic conscience." But whatever the case, I wish to make clear that by centering my attention on Mexican American films, I do not mean to diminish the role of other Latino filmmaking traditions or filmmakers. Latino Images in Film, then, is a hybrid—part new, part old. It generally focuses on fiction film, though one chapter is devoted to documentary movies. It is about stereotyping in film, about Hollywood's representaton of Latinos, and the Latino cinematic reaction. It is not a comprehensive book about Latinos in film, nor is it meant to be. To paraphrase Robert Rodríguez in the interview in Chapter 10, one book can't do everything. Obviously there are gaps—many other films, actors, and filmmakers that need to be studied. But for now, take this book as one voice in a growing conversation about Latinos in film, one that indicates some critical and historical directions that future researchers may want to explore. My modest hope is that it adds positively to that discourse. For me, this is the book I was looking for back in 1987.